Helen Perks has heard all the negatives about being an older mother. But she isn't buying them. 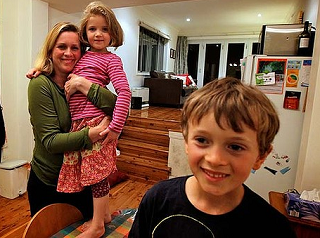 Photo: Helen Perks with four-year-old Eva and seven-year-old Max. "Some people say you're going to be old and exhausted, but it works in the opposite way," said Ms Perks, a web designer who had her first child, Max, when she was 40, and her second, Eva, when she was 43. "In fact, it encourages you. You think, 'Well, I'm going to be older when I have my kids, so I have to keep myself healthy'." Ms Perks said she was a more grounded person in her 40s than earlier in her life.